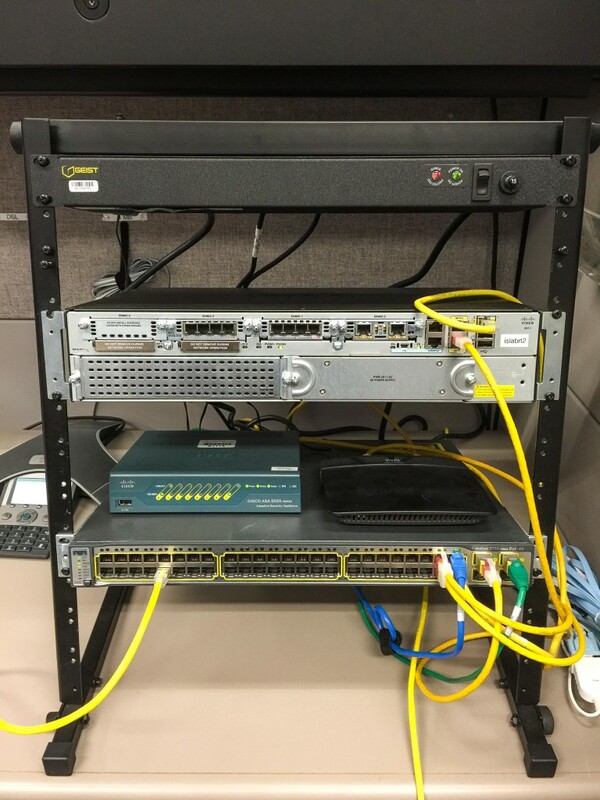 This is a great tool for a network engineer….it’s a table top network rack, 12U in height. It’s about 23″ tall, and will hold a number of network devices (depending on size and weight), and will support up to 75 pounds. As you can see, I have several devices sitting in it, handling different jobs, along with a rack-mount power strip at the top. Now, the rack isn’t perfect…although it is advertised to be the standard 19″ width of a network rack, it’s just a hair under that. (The rack is really designed to hold musicians equipment.) Network equipment does work in the rack, but you might have to squeeze it in a bit, for a certain few types of devices. Plus, I would not want to load it up to the full 75 pound limit. Otherwise, it works great. And the Linksys router allows a plain Internet port to sit at each of our PC Techs desks so they can test users laptops for VPN connectivity, and other Internet related issues. This entry was posted in Cool Network Tools on February 17, 2015 by sr71rocks. Yeah, I have used cables and kits too. Very pleased with them.